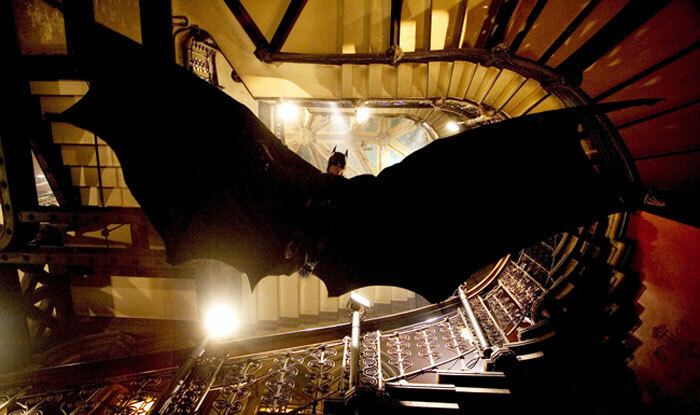 I don’t know why I had such high expectations for BATMAN BEGINS. Actually, I do … the director Christopher Nolan made one of the decade’s two or three best films in MEMENTO which both pulled the greatest last-scene mindfuck in movie history and illustrated in a coldly intellectual way Chesterton’s aphorism about men believing anything rather than nothing. His remake of INSOMNIA was a creditable achievement, an improvement on the original Norwegian policier. He managed to tone Al Pacino down, to get a good performance from Robin Williams, and to prevent Hilary Swank from wrecking the movie. So on the “let’s see what a favorite director can do with a hundred zillion dollars” theory, I was interested in the Batman prequel. I shoulda knew better. BATMAN BEGINS is less a Nolan movie than a comic-book movie, a genre that among my 30-something cinephile friends I am pretty much alone in having little interest and even apart from that no reference point whatsoever. (I’m guessing … does the little boy in the balcony grow up to be Robin?) I had a lot of cartoon comics as a boy in Britain — the truly surreal Beano and Beezer (Ernie Kovacs is the closest US comparison I can think of), the more-sedate Dandy and Topper, the smart-aleck Cracker, the Scottish staples Oor Wullie and the Broons, and to a lesser extent such “boy’s comics” as Hotspur and Hornet. While they were all left behin upon emigration, to this day, my parents often bring me back from their trips to Scotland the Christmas annuals, especially for the Beano and the Broons/Wullie, and even an old Angus Og cel. But I can truthfully say that I have never bought a comic in my entire US-resident life. Not from principle exactly, just from their being so different from what I was used to you, both in terms of format (the British ones I mention were mostly weekly anthologies of 8 to 10 recurring strips, all in 1- or 2-page mostly-unserialized stories) and in terms of subject/tone (I never cottoned to the dominant US genre of superheroes, instead of daffy humor). And those first years living in this country were a boy’s prime comic-geek years.